Spirituality has always been a guiding light in my life. I remember when I first arrived in Bali years ago, I asked my driver ‘who is the best spiritual healer in Bali’? Of course he was a unsure what to say! I was not looking for famous healer, like the one from Eat Pray Love, (Though I was not saying that he was not admirable!) But I was looking for someone who was well-known in the region, a healer of the village, does not speak English and uses Reiki and energy healing. 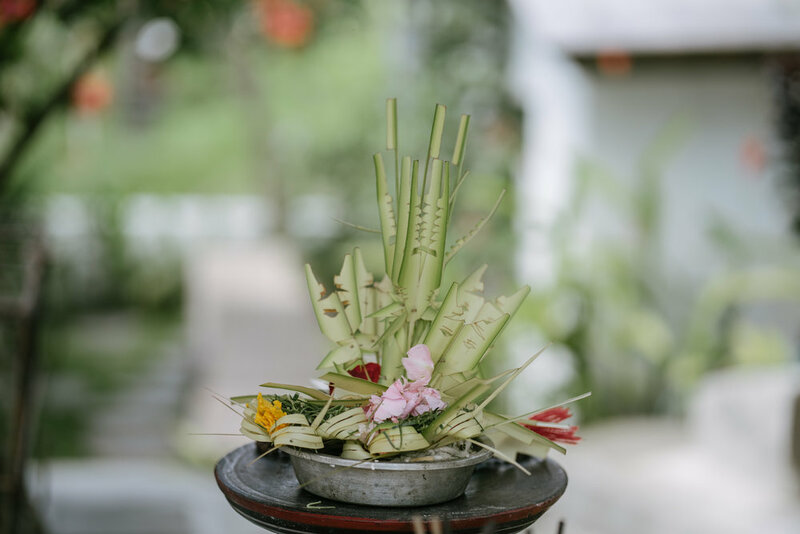 Well, when I was in the plane back home to The Netherlands, I realized that although I did everything I wanted to do in Bali, I missed one very important thing: To find a truly respectable local healer, my healer from the village who could not speak English. Soon when I landed, I decided to return to Bali and that was the start I decided to design a retreat, years ago. 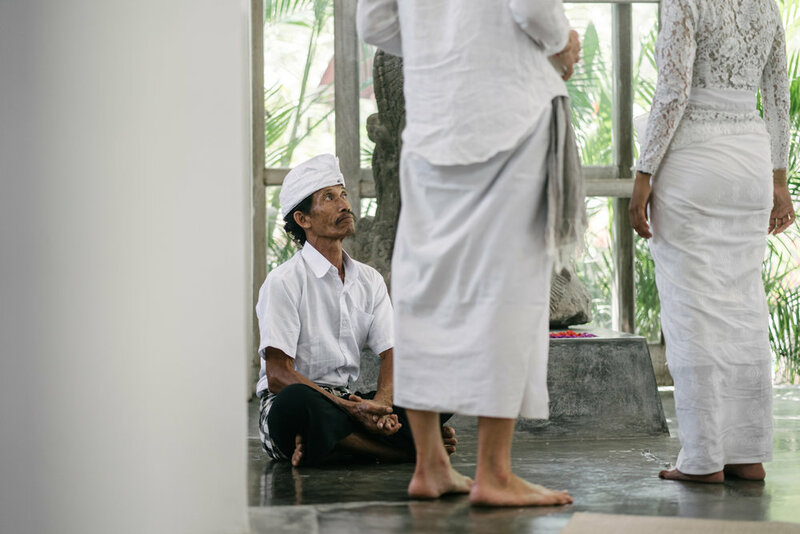 Meet priestess Tya and her father Wayan Purwadana. Wayan has been doing Reiki for more that 25 years to the people in his village. His father was a forest ranger who spent time protecting the forest and helped reforesting the hills surrounding mt. Agung. Because he spent so much time in the forest he cultivated a deep knowledge for plant medicine and adventually became the medicine man of the village. His daughter priestess Tya, has been known amongst the community by her strength and strong spiritual practice. The priest in Tya's community had died 10 years earlier and they borrowed a priest from a neighboring village to run ceremonies. But because the priest was from another village, he often showed up very late. Her community eventually got tired of this and went to see a wise elder woman in her village. They asked, "Who can be our priest, please! We need help." The wise elder woman pointed at Tya and said, "That's your priest, don't look again. Don't ask again. You've found her and you need to trust me. This is your priest." Tya's ancestor immediately came into her body. She blacked out and started singing mantra and ringing a priest bell that wasn't in her hand. She fought off a lot of criticism from her community because priests are normally men in this patriarchal society. But Tya has continued on until now as a priest in her village and is now gaining respect as the only woman chosen to be a priest of the pemangku status in Bali. Wayan and his daughter are the ones who gave reiki healing on my retreat and will give on the future ones. This has been one of the highlights of all participants during the retreat. The energy they have is extraordinary and extremely effective to relieve all sort of aches and tensions. It releases emotions and will give you a better knowledge about your body and yourself. Also Tya is the one who leads the purification ceremony, her mantra went right to our heart and the experience is purely magical. If you are not able to participate on the retreat, make sure you pay them a visit during your stay in Bali.